A pineapple (Ananas comosus) is a tropical plant in the Bromeliaceae family. This delicious fruit is full of nutrients that promote good health— raw pineapples are loaded with vitamins, enzymes and minerals including vitamin A, vitamin C, calcium, phosphorus, manganese and potassium, which are all important to your health. It is also rich in fiber and calories, and low in fat and cholesterol. Both the root and fruit may be eaten or applied topically as an anti-inflammatory. The anti-inflammatory properties can greatly alleviate the pain of arthritis. In Germany, bromelain— the extract derived from the stem of pineapples— is approved as a post-injury medication because it is thought to reduce inflammation and swelling. As an athlete, I know the importance of healthy bones, and pineapples are also popular for their ability to build and maintain strong bones. This is because this fruit contains manganese, a mineral necessary to build bones and connective tissues. The potassium in pineapple juice can help you maintain the proper electrolyte balance to prevent muscle cramps and soreness. This mineral also promotes proper kidney functioning and is important for digestion. Pineapple juice contains vitamin B6, which helps your body regulate blood sugar and helps to promote a healthy immune system. Pineapple juice is a natural diuretic. This means that it can help eliminate toxins and also help to lower blood pressure and prevent weight gain. 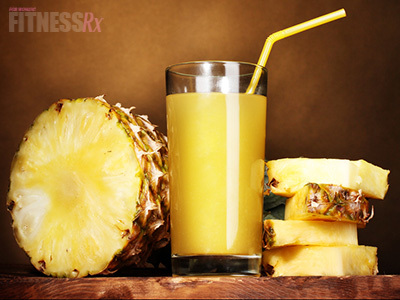 Pineapple juice also contains small bits of fiber important for healthy digestion. Bromelain has protein-digesting properties; it can keep the digestive track healthy and also help to neutralize fluids. Pineapples promote healthy gums— a key factor for your oral health.